Game related fiction seems to have a very negative reputation within the community. Most people seem to view it as glorified fan-fiction at best and downright garbage at worst. However, I've never subscribed to that common viewpoint, preferring to judge the fiction on its own merits. Occasionally I'll read a novel that re-enforces that popular reputation, but then I'll read one that proves that reputation isn't absolute. Prince of Wolves by Dave Gross is an example of the latter. Prince of Wolves was the first entry in Paizo's Pathfinder Tales line of fantasy novels set in the world of Golarion. Prince of Wolves follows the half-elf Pathfinder Varian Jeggare and his tiefling bodyguard Radovan as they travel to the Immortal Principalities of Ustalav in search of missing Pathfinder. Beset on all sides by noble intrigue, mysterious locals, and deadly creatures of the night, Varian and Radovan must use both sword and spell to discover what happened to the Chelaxian Count's associate and uncover an ancient secret of unimaginable proportions. Dave Gross gives us a very solid mystery story that is made all the better with some very interesting characters. Varian Jeggare is a noble from the infernal empire of Cheliax who takes his role as a Pathfinder very seriously, but also has a good heart and will do what he can to help someone and takes it personally when he fails. Radovan is a tough individual who has had a rough life and has a weak spot for a beautiful girl, but he's far from one note and has a lot of layers just waiting to be peeled back. Even the secondary characters, like the mute priestess Azra or the deformed villager Tudor, are great and I want to see more of them (especially Azra). Prince of Wolves also does a fantastic job at breathing life into the Gothic Horror-inspired nation of Ustalav, its tragic history, and its inhabitants. After finishing the novel, I really want to run a game in the nation and I would definitely utilize a lot of the information presented in the story. The only complaint that I have about Prince of Wolves is the writing style and the switching perspectives. The story is written in the first person and switches between Varian and Radovan every chapter. Due to the nature of a first person narrative, it sometimes took me a few seconds to realize which character I was hearing this from at which time. However, that was only a VERY minor inconvenience that didn't take away from my enjoyment of the novel all. 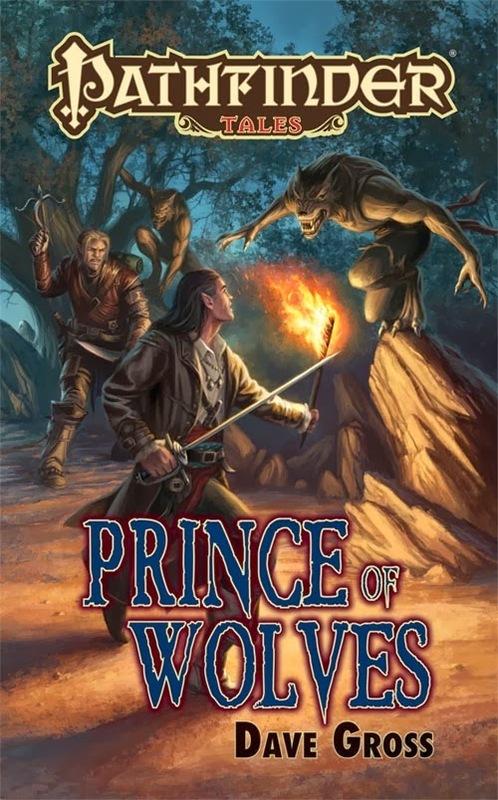 For those of you looking for a good fantasy novel with interesting characters and a good dash of mystery, I would highly recommend Prince of Wolves. You will not be disappointed. Now, I need to get my hands on Master of Devils so I can see what's in store for this Pathfinder and his bodyguard.